Combine all the ingredients into a large bowl and whisk until fully combined. Once complete, put yogurt into fridge to firm up. Use peanut butter in a piping bag to adhere chocolate chips and candy corn to the peanut butter cookie. Add peanut butter dots to the back of the waffle cone pieces and add M&M's. Fan the waffle cone feathers out on a plate and place a scoop of the frozen yogurt on top. Then place the head on top of the yogurt. We have all been there most likely at one point in our lifetime…the kid's table at holiday time. Some kids loved it. Some kids hate it as they feel they are not being included. Why not make all the kids (and some of the adults) want to be at the kiddie table by serving them this extra special and pretty darn cute Peanut Butter Turkey Sundae. Not only festive, but yummy as well. You could even have the kids decorate them, if you wanted to keep those little hands busy while you are cooking in the kitchen. Recruit an older brother or sister or even an older cousin to supervise. If you are not a fan of peanut butter, you could make these using pumpkin ice cream and a mini vanilla wafer instead of a peanut butter cookie. If you can’t find waffle cone chips, you can just make them by breaking up waffle cones. Using peanut butter, add mini chocolate chips for the eyes and a candy corn for the beak. Decorate the waffle cone “feathers”. 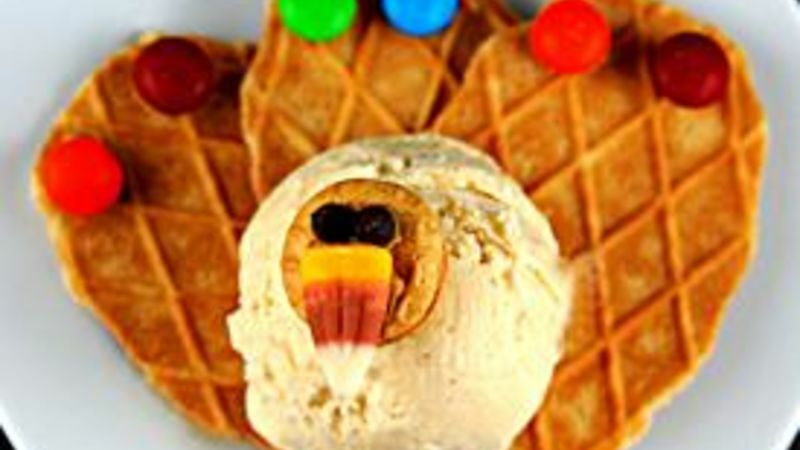 Fan out the waffle cone turkey feathers and place a scoop of the frozen Yoplait yogurt on top.Then place the head on top! Here’s a variation in a bowl. Gobble. Gobble. This Thanksgiving make the kids table something to gobble about! Peabody loves ice hockey (she plays!) and all things baking! Check out her great stuff at her blog site Culinary Concoctions by Peabody and her Tablespoon profile. This year she won't mind sitting at the kiddie table.